As an expert in your field you know what research you need to do and how you need to do it. If given the opportunity to do the research your way, the results can bring about significant changes in your field. All you need is the right walk-in chamber to meet your performance needs and to fit the space available. 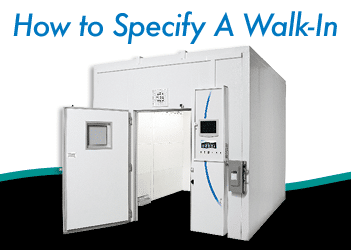 Whatever your reason for adding a new walk-in chamber, the process can seem daunting, from writing specifications and securing funding, to selecting manufacturers and ensuring the final product is appropriate for your research. Follow the five steps below to ensure your walk-in needs are clearly understood and that the installation goes smoothly. Clearly communicate your needs to the manufacturer. Clearly communicate the needs of your environment to the walk-in manufacturer to ensure you receive the correct equipment. At Percival Scientific, we begin the process by asking you to complete a detailed questionnaire. We follow up with Skype meeting, conference call, or other means to ensure the design team clearly understands your specifications. Gather precise details about the installation space. Even the most high-performing walk-in chamber will not meet your needs if it doesn’t fit the space available. Most installation problems can be avoided by taking a tape measure and a camera to the site. Measure and photograph the space before sharing the information with the manufacturer. We ask that you confirm the size a second time before your chamber is manufactured. The more pictures, videos, dimensions, and other information you can provide at this initial stage, the smoother the installation. Carefully review the final design. The submittal is the most important part of this process. The time before your walk-in is transformed from a concept to a chamber that meets your exact needs is the time to carefully review the design and make changes. At this stage, Percival Scientific gives you the opportunity to review the specifications and see a model of your chamber. Understand the utility requirements of the chamber and ensure that your contractors do, too. Percival compiles a list of utility requirements that must be in place before installation. The more options the walk-in chamber has, the more utilities it requires (e.g. CO2 supply, chilled water, de-ionized water, electrical, etc.). Be sure you thoroughly understand these requirements so as to share them with your contractors. Learn as much as you can about the operation of the chamber. After the chamber is in place, our installers will schedule a training session on proper operation and maintenance. We encourage you to include other members of your team in this training. The more you learn before the installers leave your site, the better equipped you will be to get the most out of your walk-in chamber. In addition to the in-person training, Percival Scientific provides manuals, an ever-growing number of instructional videos on our website, and highly trained customer service personnel who can answer any questions that may arise later. By following these basic steps, your new walk-in chamber will be delivering the results you need in no time. Complete our easy-to-use Quote Form for a quote on your next walk-in chamber. I am moderately sure I’ll be told many new stuff right here! Prepare Your Research Lab for a Walk-In Chamber Install - Percival Scientific, Inc.
Percival Scientific, a worldwide leader in the design and manufacture of environmental growth chambers, is headquartered in Perry, Iowa. © 2019 by Percival Scientific, Inc.